Careers in this area have the potential to be fast-moving, with lots of opportunities to progress and work in different environments. There are a number of different industries you could work in, including food and drink, agriculture and forestry. You’ll need problem-solving abilities and should be able to come up with innovative solutions when working with the latest in technology. There is always a demand for new entrants into the sector, and there are a number of different pathways available. 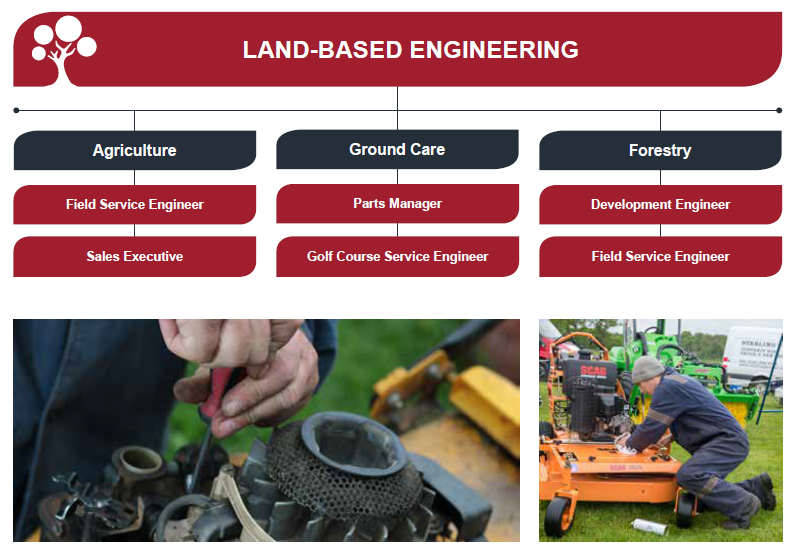 You could specialise in agricultural machinery, forestry, marketing and demonstrations or maybe you would prefer a research and development post. Take a look at the examples of typical jobs below for some inspiration, or watch our careers video. Nancy is a director of Bryson Tractors Ltd, an agricultural dealership in Lanark employing 18 staff. Michael works as an Agricultural Engineer and won the Land-based Engineering category in Lantra’s Learner of the Year Awards 2016.